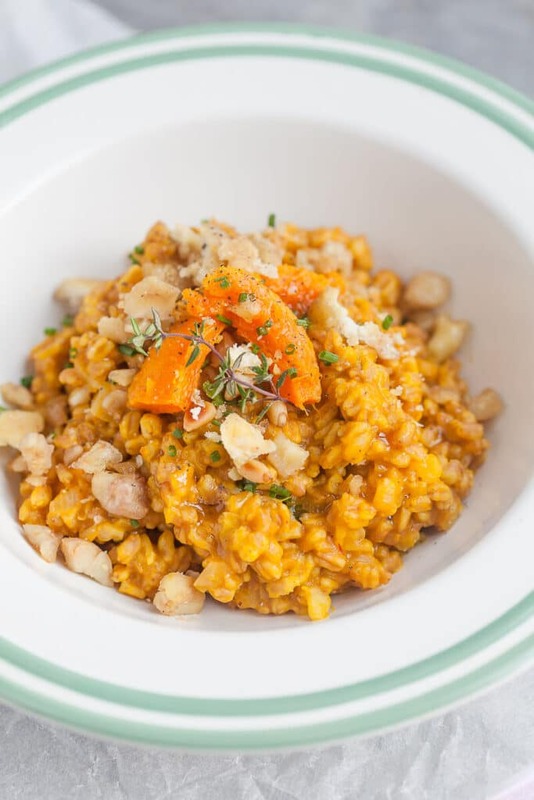 Farro Risotto is a healthier alternative to rice and goes well with fall vegetables. 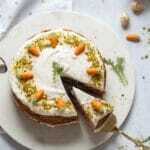 Top with roasted chestnuts for extra flavor! Are you getting in Thanksgiving mood yet? In our country, we do not celebrate Thanksgiving and there is no Thanksgiving tradition, really, although we are familiar with the custom. What we do celebrate though is fresh seasonal produce and we love to experiment with new ways on how to use it in dishes. Fall is a time of pumpkins and chestnuts, radicchio salads and warm dishes. I am most happy when I get to cook by the seasons, incorporate fresh produce in the dishes and eat delicious meals, of course. 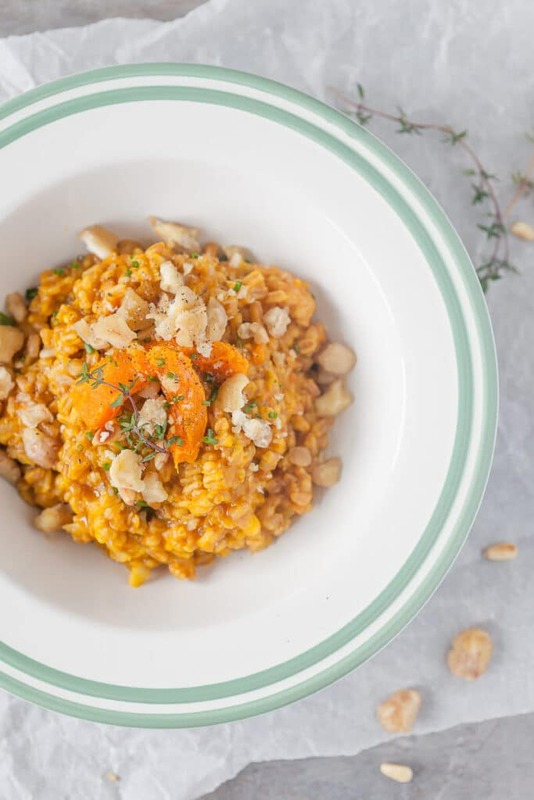 So when you’re full of turkeys, chickens, meat and heavy dishes, try this tasty & easy Farro Risotto. 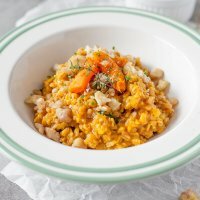 We used farro as the grain in this risotto, but rice or pearl barley will work just as well. If you don’t know it yet, farro is a wonderful grain. 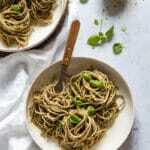 It is slightly nutty in flavor and has more substance than rice. 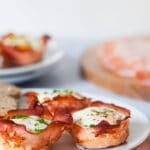 It is also full of nutrients and thus ideal after loads of fatty meals. 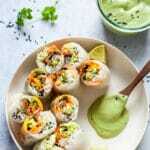 This recipe is suitable for vegetarians. To make it vegan please omit butter or replace it with a vegan alternative. Put chestnuts in a pot with cold water and bring to a boil. Let it cook on low for about 20 minutes, until the chestnuts are cooked through. 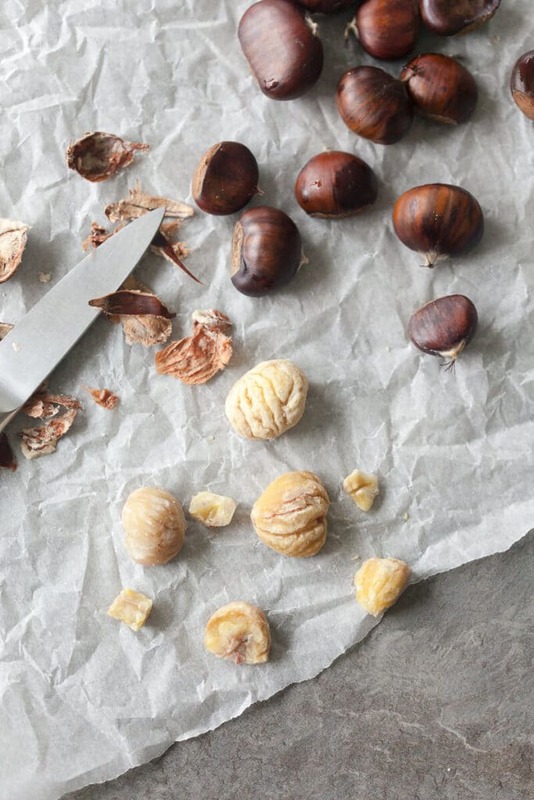 Drain and peel the chestnuts, crush them into smaller pieces and set aside. Preheat oven to 180°C / 360°F. 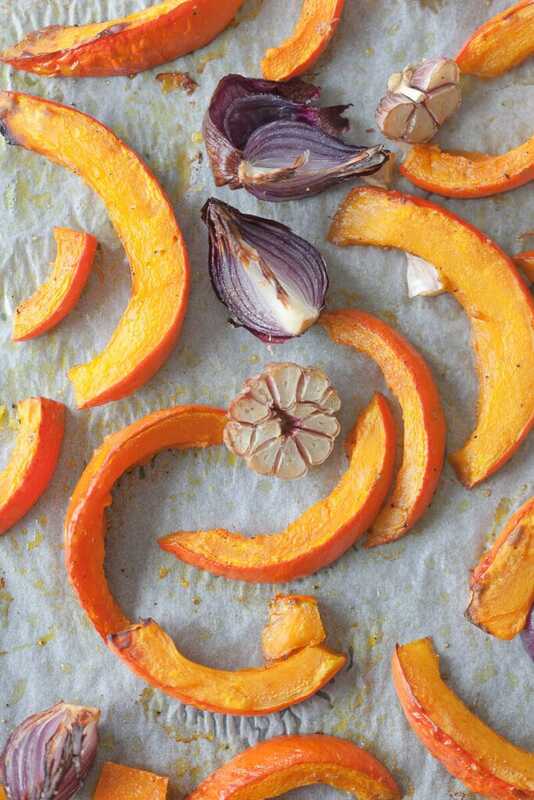 Slice pumpkin into large strips or chunks. Peel and place in a baking tray. Sprinkle with olive oil and season with salt & pepper. Mix so as to cover every piece of pumpkin. Place in heated oven and bake for about 20 minutes, until the pumpkin becomes tender. Remove from oven and set aside. Peel and thinly slice onion and garlic cloves. In a pan or pot, heat 1 tbs of olive oil on medium. When heated, add sliced onion and gently fry until translucent. Add garlic and stir. Then, add farro, mix in well with the onions and pour over 1 dcl of dry white wine. Let the farro absorb the wine, then stir and add vegetable stock. Season with salt & pepper and let it cook on low, stirring occasionally. If the farro absorbs all of the stock and is still not cooked, add warm water as needed. Cook for about 30 minutes until tender. 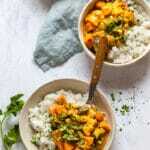 While the farro is cooking, puree the pumpkins with a stick blender or in a food processor. In a pan, melt butter, then add chestnuts and pan-roast them in butter until golden brown. Set aside. 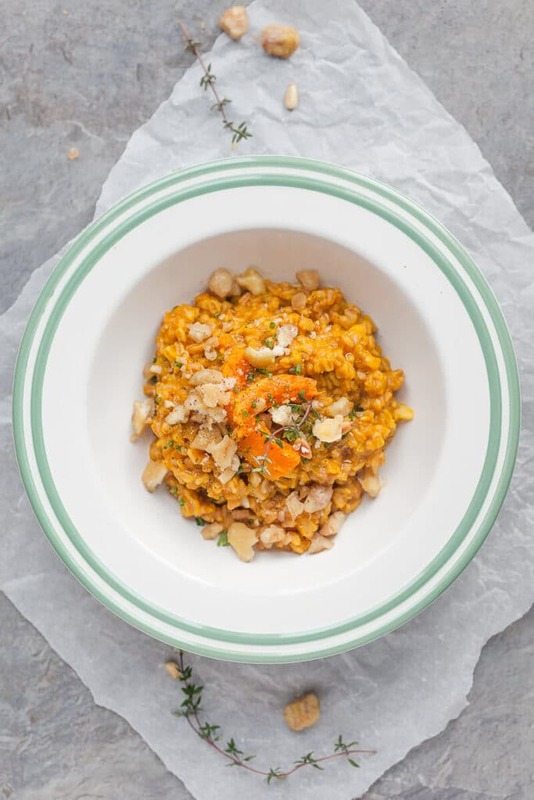 When the farro is almost cooked, add in the pumpkin puree and butter-roasted chestnuts, add chopped parsley and chives to taste and grated parmesan, then serve.